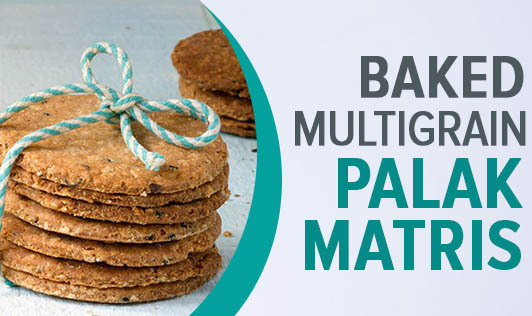 These crisp, baked multigrain palak matris are a great alternative to the fried version. They make for a wonderful evening snack, especially during monsoon season. 1. Mix all the three flours in a bowl. 2. Add finely-chopped palak leaves, til, chili powder, palak puree, turmeric powder, and gur to the atta. 3. Mix them all and knead into a soft dough. 4. Divide the dough into 40 equal portions. 6. Prick the puris with a fork. 7. Grease the baking tray with little oil. 8. Pre-heat the oven at 200°C. 9. Arrange all the puris on the baking tray. 10. Bake the puris for 10 minutes. 11. Cool and store in an air-tight container. Note: To make red-colored matrees add beetroot juice while kneading the dough.